These days the biggest buzz in Brew City, now that the Packers are out of contention for the Super Bowl, is that the convention and visitors bureau will commission a bronze statue for downtown. 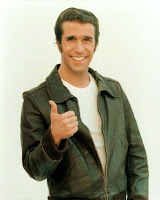 It will immortalize for all time, “the Fonz.” He’s the TV character from “Happy Days” – Arthur Fonzarelli. The “Bronze Fonz” will be installed downtown, not too far from Calatrava’s Milwaukee Art Museum, which I thought sought to raise the cultural profile of the midwestern city (that my parents left for Chicago). Henry Winkler, who played Fonzie, was on Milwaukee’s Grand Avenue Mall for the big announcement that the bureau raised the required $85,000, and the sculpture should be unveiled in late summer. 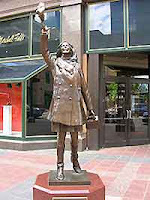 This reminds me of the statue of Bob Newhart in Chicago and Mary Tyler Moore in Minneapolis. A cynic might say these statues of the gods of TV are just to boost tourism. But I think we’re showing the youth of today what is important to their parents. And only in Milwaukee would a critic give out a phone number with the hours to call! MJS follows the venerable Whitney Gould..
You are currently browsing the archives for the Milwaukee category.